Mike Mills’ Beginners serves as a perfect counterpoint to Terence Malick’s The Tree of Life from earlier this year. They are not immediately similar films, but they share two things in common: both use an incredibly unique and offbeat visual and tonal language to tell their story, and both attempt to sum up some very fundamental elements of humanity; yet the effectiveness of the language in illustrating life varies wildly between the two pictures. Beginners is the subtler of the two, both in tone and ambition. The Tree of Life attempted to sum up the whole of humanity in its story, and had an eccentric, over the top style befitting its vast aspirations. Beginners works on a smaller scale. Instead of casting a far-reaching net, it instead contemplates love, loss, sadness, and catharsis, yet its more limited scope relates a far vaster field of human experience. There is an undeniable honesty to this picture, and that honesty is inherent in the style. Mills cuts between three different times in the protagonist’s life in a fluid, nearly stream-of-consciousness way, and while it is disorienting at first, it feels entirely natural before the end. Malick’s style for Tree of Life really was stream of consciousness, and it only felt increasingly unnatural as the film progressed, providing a pristine example of how style can overwhelm substance. 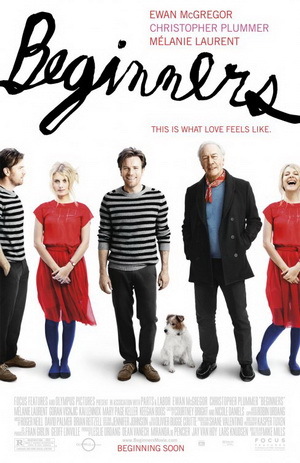 Beginners, then, plays like a master class in how to use style to the narrative’s advantage; when it’s not crushingly emotional, it’s expertly poignant, and has enough laughs to balance out the darker material. Grief and acceptance are the main themes at work here. In 2003, Oliver (Ewan McGregor) has just lost his father, Hal (Christopher Plummer). Five years before this, Oliver’s mother died, and six months after that, Hal – age 75 – revealed to Oliver that he was gay. In 2003, Hal meets a woman, Anna (Melanie Laurent), at a party, a woman whose emotional turmoil is similar to his own, and they enter into a relationship that heals both of them even as it begins to highlight some of Oliver’s interpersonal flaws. Oliver uses his father’s life, particularly the last five years, as a guide for his own relationship with Anna; Hal’s ever-evolving personality and quest for fulfillment that not even cancer could quell confuses Oliver, but in the end, Hal’s final days may have taught Oliver the most important lessons of his entire life. Hal, Oliver, and Anna are all fully realized, multi-dimensional creations, as are the relationships they share. Oliver and Anna’s courtship is one of the most thoughtful and profound screen romances I’ve seen in years, raw and genuine and entirely believable from start to finish. Oliver’s relationship with Hal is even more fascinating, as it is told across two time periods, before and after Hal’s death. Even when Hal isn’t on-screen with Oliver, his presence is felt, and Oliver’s grief at the loss of his father is almost unbearably palpable throughout. This too is one of my favorite cinematic relationships I’ve seen in a long while, one that tackles the complex bond between a father and son with insight and honesty. The characters shine thanks in no small part to the incredible performances that bring them to life – Ewan McGregor is at his absolute best as Oliver, full of sincerity and subtlety, while Christopher Plummer provides the film its heart and soul as Hal. Melanie Laurent, best known for Inglourious Basterds, more or less steals the show, expressing more with a silent glance than most performers could with a rich and lengthily monologue. With such expertly realized characters and relationships, Mills is able to craft a story that should strike at the heart of every viewer. Through Oliver’s tale, Mills illustrates how much of life is a struggle, and the many different kinds of obstacles people encounter in their search for happiness. Hal’s story, for instance, must stand as one of cinema’s most strikingly honest portrayals of homosexuality, particularly for those like Hal who grew up in a much less accepting time. Yet there is a shining light in the darkest corners of each of these stories - Hal found a way to be happy with Oliver’s mother for 44 years, and once she passed, he pursued his dreams with the vigor of a much younger man, a vivacity that inspires both his son and the viewer. Every element of the film is an expert balancing act between the dark and the light, all captured with an immediate realism that is engaging and rewarding. There is so much to be learned watching Beginners, but Mills’ main point, and the one that spoke most strongly to me, may be that sorrow and catharsis are not separate processes, but two halves of a constant, ever-evolving progression more commonly known as life. Therein lies the crucial difference between the subtle and contemplative Beginners and the large, extravagant Tree of Life: Beginners is ultimately uplifting, a quietly encouraging message to those who grieve or struggle, which is all of us. In my review of Tree of Life, I said it left me cold, but depressed might be a more accurate term, or even emotionally drained. Beginners deals with arguably darker subject matter, yet it has the laughs and poignancy to keep us engaged – in short, it is as complex as the lives we lead, and in that way, it gets amazingly close to defining the qualities that make us human.